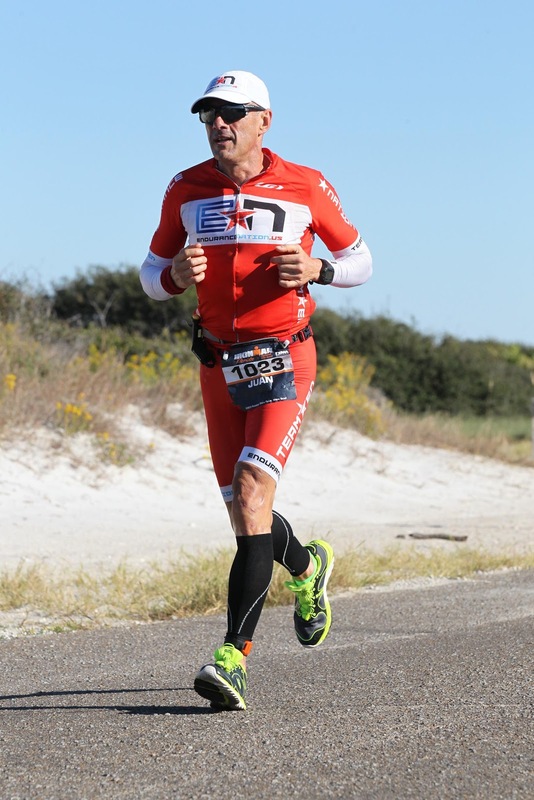 Endurance Nation invites you to take five minutes and read an interview with one of our most enthusiastic Ambassadors. Unedited, the road from beginner to Kona in less than 5 years is an interesting read. Connect with Juan on social media, inside the team or at races and catch his infectious spirit for our beloved sport of triathlon. Juan: Actually it’s a funny story. Early 2010 I received a call from an old friend my age (50 at the time) inviting me to join him in a triathlon. My first question to him was “a what?”…. At the time I had no clue what a triathlon was and despite him telling me that it was a “short” swim-bike-run in a so-called sprint format, my first reaction was to tell him “you’re gonna kill yourself …. I will call you the evening of the race to check if you survived” I took note on my calendar (I write everything down in my calendar) and so my phone gave me an alert on June 6, 2010 (will always remember that date) …. “CALL MAURICIO, CHECK IF ALIVE”. Googled “my first triathlon” and rapidly learned that step 1 was to sign up for a race and commit to it. Googled “sprint triathlon training” and figured a 3 month window was enough. Googled “sprint triathlon Brasil”, found the perfect race in September and signed up. Googled “sprint triathlon for dummies” and surprisingly the actual book DOES exist as such. Bought that exact book and a second book called “The complete idiot’s guide to triathlon training”, to date my favorite, carefully read it all and immediately began following their sprint training plan ending on the date of the race I had signed up for. Borrowed an old QR tri bike from a friend and made my “debut” in early September 2010 with a AG 5th place and a podium which I thought was “beginners luck. In the mean time, I had convinced my brother in law to sign up for a triathlon, which he did under the condition that I flew to Miami to race with him (one week after my first sprint). I agreed so I took a flight to Miami, rented a road bike and went for my second race. Already a “veteran” I lined up at the front of my age group for the swim and in the end came in 3rd in that race, another podium and totally infected with the tri-virus. An that is how it all began (wow a long answer to a short question!!!!). Juan: Well, after that second podium I figured I was not that bad; it all happened at a point in my life where I had recently decided to retire and was in the process of re-gaining my form which I had totally neglected in over 30 years of Corporate life and – most important – re-defining my life style for what I had defined as “my purpose” after retirement (actually it’s the other way around; I re-defined my purpose in life and that led to retirement). Making a very long story short triathlon was a perfect fit and I had (and still have) the luxury of a totally flexible schedule. One thing I learned in my initial google studies of the tri-world is that triathletes wake up very early to train; because they have to, not necessarily because they like to. Well I did not have to, I did not want to, and thus I had nobody to train with. Further, a few of the so called coaches I talked to did not inspire me. That does not mean there are no good coaches in Brazil (there are) but I did not come across them and so I started researching “on-line- triathlon-training”. And it was not Google who took me to Endurance Nation but a Guatemalan friend of a Brazilian friend who provided a list of those he had heard (but not tested) where the best on line triathlon platforms. I read all I could find on those (I believe the others were Training Peaks and Mark Allen) and somehow identified myself with E.N., signed up for a trial period and here I am, faster at 56 than I was at 50. And definitely happier. I love our nation!!! Juan: Definitely the knowledge absorbed from EN is a huge asset and getting bigger by the minute as there is still and forever so much to learn here. But I am totally results oriented and knowledge alone is worthless to me. What I’m most happy with is not how much I have learned but the results I have been able to achieve through that knowledge and – most important – how that knowledge and those results contribute to the fulfillment of my redefined personal purpose. Triathlon is an important and vital ingredient but is not the purpose per se. Juan: I grew in a corporate culture that believed (and still does) that dreaming is for free so why dream small when you can dream big? It is by dreaming big that “impossible” targets were set and achieved year after year where I worked. It is by dreaming big that I had a successful professional career that allowed me to retire quite young. Well I retired from the office but did not retire my beliefs and my values so I had to dream big in triathlon as well. My wife (or better said my fabulous wife) who obviously knows me better than myself, was the first one to say “Oh my God, I can see you going after being an Ironman”. That was after my first race!!!! At the time I obviously ignored her forward thinking and focused on getting better at the sprint distance. Obviously it did not take very long to raise the bar and target “finishing” an Olympic triathlon, which I did in February 2011 (my first race as Endurance Nation using O.S. as my race prep for Oly). I was not in the podium on that first Olympic race (which made me crazy because I had been in the podium in all of my sprint races since the first one) so I set myself a higher goal which was not to podium an Oly but to win an Oly within one year ….. which I did 3 month later in May 2011. Having achieved that goal (a bit faster than expected) a higher goal was needed so I signed up for my first HIM in Florida 2012 with no goal other that to finish alive. In the back of my mind I did want to be under 5h30 just because a friend of mine (20 years younger) had recently completed a HIM in 5h30. I failed by 47 seconds coming in at 05:30:46 and immediately signed up for MIAMI 70.3 that same year targeting sub 5h. (04:52:48 and 8th place AG was the result). For the 2013 season (even though my lovely wife continued to say “I’m convinced you want to be an ironman”, I was not completely against the idea but had already learned quite a bit within EN and knew that patience and discipline was key and I did not want to move up to full distance just for the sake of hearing “you are an ironman. So I decided to sign up for exactly the same races as in 2012 with the objective of a PB in all 3 races. Which I did (in all 3), ended the season with a 04:45:42 in Miami 70.3 (5th AG) and immediately began to carefully plan how to carry that speed into my aging up year of 2014 to attempt not only being an ironman but the impossible Kona dream. What came after that was lots of planning, lots of hard work, and lots of help from Endurance Nation. Not only and always Patrick and Rich, who helped me map out my season at a macro and micro level, but the amazing team mates who provided so much knowledge and at the right time challenged me to dream even bigger than what I had thought was already big enough for me. My first full distance was IM Los Cabos in March 2014 and despite a quite descent (for a first attempt) 6th place, I literally screwed up the run and missed that Kona slot by about 20 minutes with a “terrible” 04:20:21 run. But I did learn my lessons and worked hard on my run for IM Florida in early November 2014 where I finished 2nd (AG 55-59) and happily got my Kona slot. So again a long answer to a short question which can be summarized by saying HARD WORK WORKS!!! Juan: Being very (sometimes excessively) competitive I constantly remind myself of Coach Rich’s phrase “IT IS JUST A GAME”. That is certainly the one key piece of advice for us non pro triathletes. Remember that staying healthy and enjoying “the game” is more important than the game itself. An in the end both are two key ingredients to gain speed. Nothing will slow you more than not being healthy or unhappy (and vice versa). Juan: My favorite is always the one that is on the mail!!! I’m one of those that always has “something” on the way. I only stop buying 12 weeks out from a race when I know that no more changes are to be made and focus totally on race prep making every session a race rehearsal in one or another aspect. Juan: I’m a father of four, two beautiful grown up girls (25 and 18) and two little boys (12 and 8); married to super Karla who is as fanatic and disciplined with tennis as I am with triathlon. Which makes everything much easier because we understand each others “pains” … “injuries” … “insecurities” …. “crazy habits” …. Happily we talk the same “sports language”, eat and love the same food and have the same passion for our family. Going to Kona this season? Whether you punched your ticket to the Ironman® World Championship on the big island of Hawaii or simply want to experience triathlons biggest race of the season, join in the fun at our Kona Experience Camp! Something for everyone.